Ruthie has taught over 1200 hrs of yoga, workshops and retreats. Ruthie’s yoga practice began in 2004 at Dynamic Hot Yoga, she practised the sequence for 3 years until starting Vinyasa and Ashtanga in 2007. Right from the start yoga made sense to Ruthie more than any other system, so she undertook training in 2011 as a Vinyasa teacher. Since qualifying she has completed advanced teachers training with Ana Forrest (Forrest yoga) and Manju Jois. Since 2009 she has mainly practiced Ashtanga led but in 2015 at age 40 she started a committed daily Mysore practise which is self led with individual guide of a teacher – this has deepened her understanding of the postures and flow of the Vinyasa. She continues to train daily with her teacher and also continues to learn in intensive studies with international teachers David Garrigues (asana kitchen) and Petri and Juha in Finland who are Authorised Ashtanga teachers. Ruthie is also a qualified Humanistic therapist PGDip and has a BA in Humanities & philosophy of society and of the self. This philosophy interest has led her to intensively study the sutras, chants and philosophies of Hinduism specifically Vedanta. 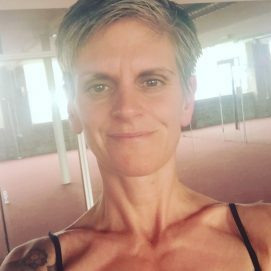 Ruthie is passionate about bringing a focus of concentration and discipline back to the practice and accessing a connection back to ourselves. Ruthies classes are strong but careful, she is a kind teacher who is knowledgable regarding physical anatomy and injury prevention. She looks forward to meeting you on the mat.